The feat of circumnavigating the globe in a boat has fascinated skippers for centuries and is regarded by many as the greatest maritime test of them all. This ambition has led to creation of a number of races over the years that consistently manage to push the feat ever further to the reaches of what the human body can withstand. Arguably the most famous globe circumnavigating boat race is the Volvo Ocean Race, which takes place roughly every four years. It has claims on being the definitive combination of top class sporting competition and seat of the pants adventure, mixing onshore glamour with offshore high drama and survival. As long as there are no wild diversions, the race typically takes over nine months and covers over 39,000 nautical miles. It takes place over 11 legs, and incorporates stops at around 12 ports across the world, and eight inshore and eight pro-am races. Its typical race route begins in Europe in September and then runs down through the Atlantic Ocean, corners around Africa’s southerly point, and then braves the often treacherous waters of the Southern Ocean before cornering again at Cape Horn at the southern tip of South America and heading home up the Atlantic. The Volvo race may be the most celebrated world boating event, but it’s open to debate whether it is the greatest maritime challenge of all. The Vendee Globe race stakes its claim by restricting entry to solo competitors and not allowing any stops on route, thereby intensifying the mental and physical strains to almost unbearable levels. 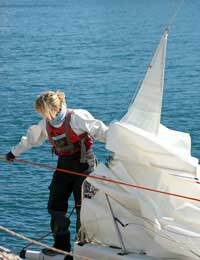 This phenomenal test of endurance hit the headlines in 2001 when 24 year-old Briton Ellen MacArthur became the youngest and quickest female to sail all the way around the globe. Her vessel the Kingfisher took just 94 days to return back to Les Sables d’Olonne in France after traveling round eastwards with the prevailing winds. The BT Global Challenge – once known as the British Steel Challenge - adds a different dimension to this familiar round the world feat by challenging its amateur competitors to sail the wrong way around the globe, by taking the westward direction against the prevailing winds. Our environmentally-conscious age has inspired a new twist to the way boats circumnavigate the globe. The ecoboat Earthrace intends to break the round the world speed record with only biofuel in its fuel tanks. This laudable feat aims to use the race as a way of promoting awareness around the world about the fate of our planet and benefits of sustainable resources. Remarkably the history of round the world racing stretches at least as far back as 1522, when Ferdinand Magellan led an expedition from Spain with five ships and 237 men. The historic voyage was eventually completed three years later, albeit missing four ships and 219 of the men, including Magellan himself. 1898 marked the year when the American Joshua Slocum completed the first solo round the world sail. The journey had also taken 3 years, a time span in part due to Slocum stopping off on route to stock up on supplies. In 1969 British sailor Robin Knox-Johnston managed the first non-stop circumnavigation when he returned home to Falmouth, England, after winning the Sunday Times Golden Globe Race.